Bro. Eli, I’m a Catholic. I just would like to be enlightened on what verse(s) in the Bible can you find the place where the soul of dead people go until such time that the day of judgment comes. 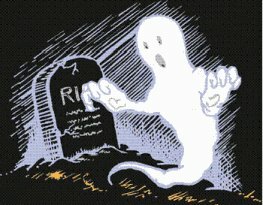 Is it true that if a person dies suddenly his/her soul still haunts the area where he/she died? Is it true that their souls stay here for the first 40 days after death? I would be very glad to answer your question using the Bible as the basis, where the word of God is recorded. But in a corner of my mind, I feel sad and sorry for your question because I can perceive that so many Catholics like you are lost in their belief not because they are hard headed people, but because they are being deprived by their priest of the proper knowledge due them. A teacher or a preacher must teach the entire truth of God available in the Bible for the salvation of man. The danger of being deprived of wisdom and understanding may result into destruction. It is God’s commandment and an outstanding responsibility of a preacher to make known unto His people the word of God. The fact that not only a word but, an entire doctrine is not being taught you by your priests aggravates their negligence and your chances of being lost. History and documents testifies to the inability of Catholics authorities to teach the truth to about a billion adherents of the Catholic Church. For so many centuries, Catholic authorities from the pope to the parish priest made people believe that there is a limbo: where souls of unbaptized children go if in any case they die. I know you are using a computer — maybe a laptop. May I help you through your computer find the truth. You can search the entire Bible looking for the word ‘limbo’ in less than 15 seconds. Limbo is not a teaching of the Lord Jesus Christ, neither; it is apostolic, because it is not in the Bible and is an ‘invention’ of Catholic priests. These inventions are also called in the Bible as fables. 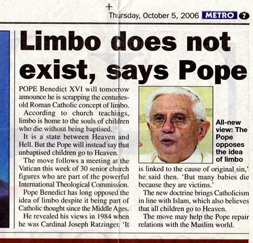 Millions of Catholics have died in the past believing that there is such a gory place called limbo: But now, to the surprise of the world, the present pope discarded the doctrine of limbo and threw it into the vault of oblivion in the Vatican City. Souls of unbaptized children go to limbo and souls of grown ups go to purgatory. You must not be surprised if someday you will wake up to know that the Pope is also discarding the doctrine of purgatory, after all, it is not in the Bible, nor the idea of it. But where do souls go after death? Will they linger for forty days near the place where they died and hunt for anything? Let us consult the word of God. After the death of our physical body even our memory and emotions do perish. A dead man can do nothing. The spirit returns to God and the dust returns to dust. This is so if the one who died is a godly man, his spirit will return to God, but if a man is wicked, then his spirit is imprisoned until judgment day. What about the soul? You must understand first that the soul is not the spirit and the spirit is not the soul. The spirit and the soul can be divided or separated by the word of God. What is the soul then? The union of the flesh or dust from the ground with the breath of life is what became a living soul. Your entire being plus your emotions, memory and faculties is the soul. If someone dies the soul is in the hand of the Creator, The entire being of a man is in the hand of God after death, and will remain under God’s power until the resurrection to face judgment. This gives us peace of mind for we know that the souls of our dearly departed are in the hands of God. A vision was seen by John wherein the souls of murdered Christians are asking for God’s justice, but God told them that the time of vengeance has not yet come, and said, they should rest for some more time until judgment day. Can there be any part of your being that will linger on earth or return to your house and stay for 40 days? None! The CBCP (Catholic Bishop’s Conference of the Philippines — the largest Catholic country in Asia) said that the soul of a departed relative may visit their former dwelling place and relatives, and even advised their love ones to listen to their message, in utter rejection and defiance of the Biblical teachings of God. God prohibits the living to consult the dead. It is an abomination in His sight. (Deuteronomy 18:10-12) “Don’t sacrifice your children in the fires on your altars; and don’t let your people practice divination or look for omens or use spells or charms, and don’t let them consult the spirits of the dead. The LORD your God hates people who do these disgusting things, and that is why he is driving those nations out of the land as you advance.” Good News Bible translated with permission by Catholic authorities. The complete Bible has the imprimatur of John Francis Whealon, Archbishop of Hartford. I want you to think about this, if there really is a purgatory, how can they visit their former dwelling place and love ones. The truth is, that they will be in God’s hands until the resurrection. What will happen in the resurrection? Nobody can escape God’s judgment; the dead will be resurrected to face the judgement seat of God. Next StoryWas Jesus Christ An Essene?